Second. The two “no thanks” horses were reluctant but not flighty or panicky. To incentivize them, Penny and I, working with one at a time, ponied them. One of the ponied horses held back very briefly and came along, following Penny’s confident lead. The other one was slightly more hesitant, so we ponied around a bit and soon, almost without her noticing, she was in water. This ponied horse is Regina. We wanted to go slow enough so that she stepped in and did not jump. It worked! Fourth. We ponied with the rider up, as a passenger. Over and back and along the length. This can give the rider confidence that the horse can do it and the horse confidence that the rider can do it, as well! Pat and Regina, done with over and back and on to up and down the creek. Fifth. No more ponying, just following. This allowed the learning horse to continue to take advantage of Penny’s “we got this” attitude. Nobody needed much time at step five! Sixth. All on their own! Over and back. Over and back. And then there were a few moments of hesitation by both horses which led to a little hesitation by the riders. But, knowing the horses could do this (having just done it while being ponied) allowed the riders to ask a little more confidently. 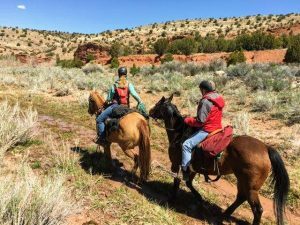 The horses took the cue and crossed! 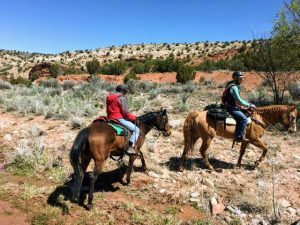 Attitude and intent are integral to successful horse and rider teamwork! Cap says: “water! i love water!…now that you got me in.” He loved it so much he started to think about laying right down in it and having a bath! 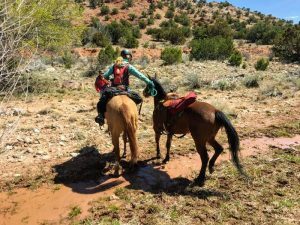 This was introductory water crossing, so it is to be expected that when these horses first encounter a more difficult water crossing (difficult being all relative–our Pecos Wilderness water crossings are not deep or lengthy), they may need support. 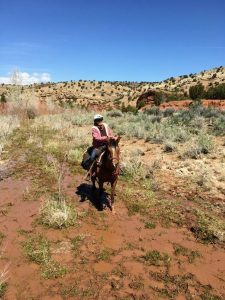 Both were so willing and level-headed, however, that closely following a mentor horse is likely to do the trick, and if not, they could very easily be ponied again. 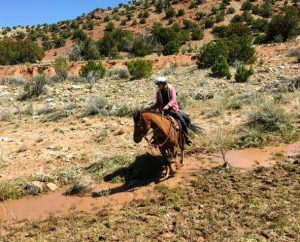 With just a little more water under their hooves, these two horse and rider teams will be NM water-broke! I was able to read the 1972 article ” DRUGS, PERFORMANCE AND RESPONSES TO EXERCISE IN THE RACEHORSE 2. Observations on Amphetamine, Promazine and Thiamine G. A. STEWART, M.V.Sc. Three horses were used in the trials. Injection of 0.5mg/kg 3 of thiamine 30-60 minutes before galloping resulted in calmer horses on the way to the track in 3 of 7 gallops. It was not clear if the response was seen in one animal three times or in all three animals, once each. There was no effect of thiamine on heart rate, respiration or speed, whereas promazine slowed things down and amphetamines increased the rates.